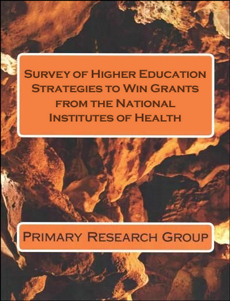 The Survey of Higher Education Strategies to Win Grants from the National Institutes of Health includes data and in-depth commentary and analysis based on extensive survey results from more than 30 research universities, medical schools, and other colleges pursuing NIH grants. This 132-page, must-have resource provides a rich set of data to compare your practices in pursuing NIH research grants with other research institutions. It’s jam-packed with dozens of easy to scan charts and figures displaying critical data you can’t find in any other publication. How skilled do universities view their researchers in making contacts at the NIH, understanding its range of grant programs, and foreseeing questions that might be posed in NIH peer reviews? What percentage of grants are R01 grants? What percentage of grant volume results from collaborations with other institutions? With the private sector? How many schools have hired consultants to assist with NIH grant pursuit and what have been the results? How much staff time do institutions expend in monitoring the NIH for grant opportunities? How many institutions have grant mentoring programs for junior faculty? How many workshops do colleges offer annually in NIH grant preparation, and how well attended are these workshops? How do universities evaluate their NIH grant procurement efforts? The data in this comprehensive report is broken out separately by criteria such as college size and type, as well as by NIH grant volume. Data is also presented separately for research universities, medical schools, and other institutions. Compare your university to your peers! Get detailed analysis and results in more than 140 data tables included in this report! The Survey of Higher Education Strategies to Win Grants from the National Institutes of Health is available for the low price of just $275, in print or PDF. You can also make this invaluable resource available to your entire organization with an economically priced site-license purchase – just $395.